This branch of the Rieck family emigrated to Canada in 1873 from Vietlübbe, Mecklenburg, Germany to escape economic hardship following the Franco-Prussian War which ended in 1871. Evangelical. At Parchim, Siggelkow, Grebbin and Gischow in Mecklenburg, Tacken in the Priegnitz, Berlin, Preston and Kitchener in Ontario in Canada, Portland in Oregon, and Tacoma in the State of Washington, United States of North America. The forefather of the lineage was Heinrich Rieck, born 1632. He arrived in Vietlubbe early in 1665 and probably came from Holstein, like his wife, Anna Wahlsen. 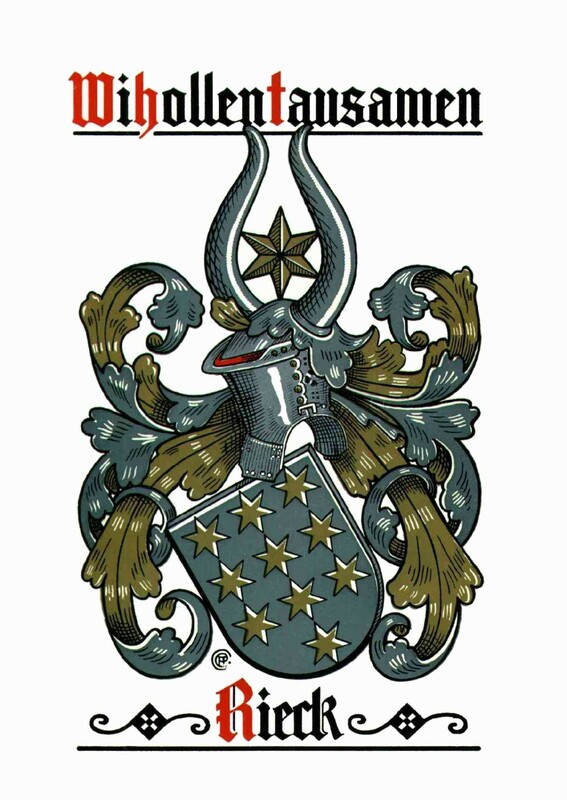 Christian Rieck, (born 1694) whose descendants still live today at Preddohl in the Priegnitz (Rieck Family III). Records indicate that in 1703, Heinrich Rieck1, (born 1632) farmed at (lot?) No. 11, Vietlubbe, a place with a small cottage. In 1711 this land was in possession of his third son, Christian.2 In 1704 his eldest son, Carsten, still lived in Vietlubbe and worked as a hired hand, and by 1711 appears to have been owner of a half-hide of land at Plauerhagen, lot No. 6. His second son, Heinrich, was a sheep-herder at Dammerow and left Mecklenburg for the neighbouring Priegnitz, and there established the Rieck Family of sheepherders. His branch of the family still thrives today at Tachener, and Groez-Vankower. Hartwig, (our lineage) stayed in Vietlubbe, and Joachim was a farmer at Zarchlin, near Plauerhagen. 1 In the German text, Heinrich Sr. is referred to as a Halbbauer, which means a half-farmer, and Christian as a Halbhufner. In the Northern German dialect, a hufner is the owner of a hide of land, a hide being about 60 to 100 acres. So he either owned half the farm, or the whole farm in joint partnership. 2 In 1704 his half-holding was planted and yielded: 4, bushels rye, 4 bushels barley, 1/4 bushel peas, 4 bushels oats, 1/4 bushel flax, 2 loads meadow hay, 1/4 bushel garden; 1 house, 2 good horses, 2 good colts, 2 cows, 1 calf, 8 pigs, 3 piglets, 4 sheep, wages, R 13 (Reichmarks? ), debts, R 20. The property owned by the Rieck family in the 18th and 19th century at Vietlubbe, was two farmyards (the Rieck-Garnatz near the parsonage, and the Jakob corner piece) as well as the Rieck homestead, it being the only house that was not destroyed by the great fire of 1878. Annually since 1921, an edition of the family newspaper has been prepared of the Reunions of the Rieck Family registered in Koslin. 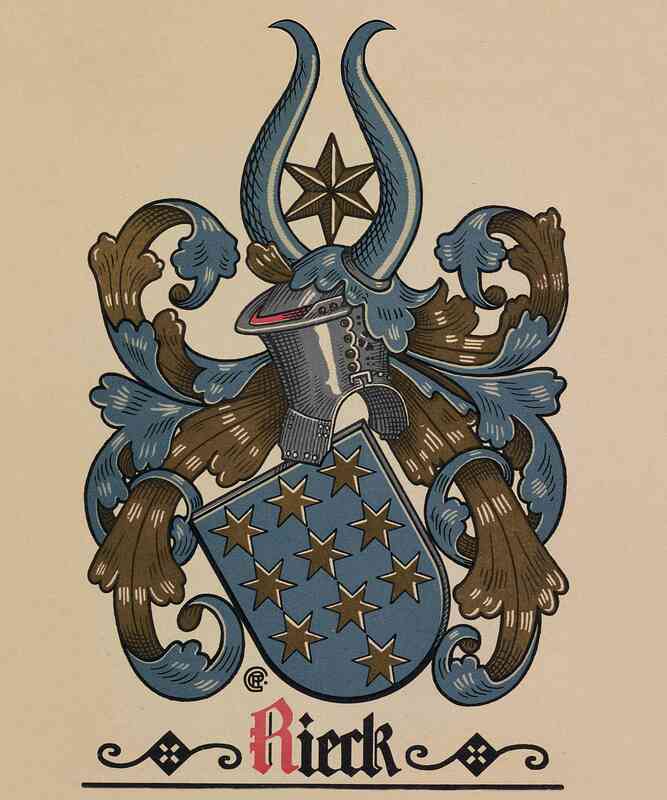 The name Rieck is the modern High German form of the name that was already in use before Germanic time, and originated from the root word "ricja" which means rex (Latin for king.) We come across the Gallic source "rig" in the name Bojorix, in the Zimbern War. The German language has the word "reiks" meaning kings, and "reiki" meaning rich; also the root word "rica" as a noun, and "ricja" as an adjective. The very old age for the basis of the name can also be verified in the modern High German. The name Theudoricus can be found in the first century; later the names Rihc, Rih, Richus, Righus. Berlin Ontario (while under virtual occupation by the British) was renamed to Kitchener Ontario in 1916. 2 2. Katharina, b. May 17, 1671, d..; m. Vietlubbe Oct. 12, 1690, to Jochim Frahme, b. 1659. 2 3. Anna, b. Feb. 20, 1674, d. Vietlubbe June 6, 1721; m. Levin Havemann, b. 1663. 6 2. Johann (John) Christian Theodor, b. Oct. 28, 1832, d. at Juneau, Alaska, 1915. (age 83; 2 daughters, 3 sons; Heinrich, Johann and Wilhelm were married but childless; lived in U.S.A.
6 10. Marie Dorothea Hanna Elisabeth, b. Oct. 12, 1851, midwife at Siggelkow near Parchim; m. at Grosz-Pankow in Mecklenburg, May 9, 1879, to Heinrich Friedrich Johann Christian Niclas, b. Siggelkow, Sept. 29, 1851. Note: Sons #8 and #11 were both named Friedrich. This is not a typo. 7 1. Friedrich, b. Dec. 6, 1867 in Vietlubbe, d. Portland, Oregon, U.S.A. (Had 3 sons, Walter Villi, Arthur Vilik, and Raiph Vilil) - for some reason, the letter j is not used. 7 3. Louida, b. Berlin, May , 1877, d. Nov. 19, 1969; m. Harry Rau, d. 1961; lived at 824 Queen's Blvd., Berlin. (age 92; 5 children): Harry, Edna (Mrs. Fred Filsinger), Leonard, Wilbur, Olga (Mrs. G. H. Sprague). 7 Wilhelm (William) Christian Theodor Rieck b. Vietlubbe July, (died age 90) 21, 1873. Came to Canada at about 4 months of age; d. Aug. 1, 1963; m. Oct. 8, 1895, to Mary Heimbecker of Elmira, b. Jan. 23, 1871, d. Jan. 1, 1952 at age 80. He worked at Huck Glove Co. Ltd. They lived at 45 Park St., Berlin. 8 2. Oscar William, b. Aug. 8, 1904 Berlin, Ontario. 8 Oscar William Rieck 1 b. Berlin August 8, 1904, d. m. Kitchener May 9, 1924, to Louise Florence Oswald, b. Toronto Sept. 2, 1905, d. daughter of Gregory Oswald, b. Toledo, Ohio, and Charlotte Beadle, b. Auburn, Ont., April 22, 1875. Worked for the Kitchener Parks Board from 1921 until 1939; then to the Kitchener Police Department until his retirement in 1965 as a Sergeant. He was a small arms instructor and an expert revolver marksman. 9 Walter (Wally) Oscar Rieck, b. Kitchener (Bridgeport) Feb. 05, 1925, d. Kitchener Oct. 1988, m. Kitchener June 05, 1948, to Lucile Ardell Schenk, b. Kitchener July 18, 1925, d. Kitchener Sep 6 2002, daughter of George Schenk, b. Wilmot Centre, Ont. June 1, 1881, and Gertrude Culhane, b. Hamilton, Ont. Sept. 7, 1881. 10 2. Mavis Anita, b. June 7, 1955, m. Kitchener June 28, 1980, to Paul Leo Hicknell, b. Nov. 25, 1953, son of Leo Hicknell and Carolyn Strauss. Daughter: Emily Louise, b. March 13, 1982. 9 James Bernhardt Rieck, b. Kitchener (Bridgeport) June 06, 1926, d. 2004, m. Normanby, Ont., June 4, 1949, to Eileen Elizabeth Hollinger, b. March 8, 1927, d. , daughter of Noah Hollinger and Aifreda Kraft. 10 2. Bruce James, b. July 16, 1953, d... m. Nov. 4, 1981. 10 3. Mark John, b. Sept. 04, 1957. 9 George Earl Rieck, b. Kitchener August 14, 1927, d. m. Roseville, Ont., June 7, 1947, to Margeurite (Marg) Estelle Veitch, b. Roseville, Jan. 06, 1927, daughter of Melville Veitch and Gertrude Fried. 10 1. Debra Louise, b. Oct. 12, 1951, d. Married twice: (a) Kitchener, Sept. 24, 1969, to Duncan Etherington; divorced; no children. (b) Kitchener, Feb. 2, 1974, to Nickolas Johannes Smits, b. Ors, Holland, April 14, 1954. Son: Clinton William, b. Oct. 05, 1977 Daughter: Nicolle Estelle, b. Oct. 28, 1979. 10 2. Thomas Melville, b. May 25, 1957, d. m. Waterloo, Ont., Sept. 24, 1977, to Kimberly Ann Hergott, b. Apr. 23, 1958, d. daughter of Roy Hergott and Jane Rahn. Daughter: Alexis Lynn, b. Kitchener Apr. 25, 1982. 9 Robert William Rieck, b. Kitchener Dec. 31, 1930, d. 2002 m. New Dundee, Ont., Oct. 4, 1952, to June Elaine Eckstein, b. R.R. #1, Plattsville, June 20, 1933, daughter of Oliver Eckstein & Lucinda Rosenberger. 10 1. Julianne Elizabeth, b. June 11, 1955, d. m. New Dundee, Ont., June 10, 1978, to Robert Bruce Hull, b. April 12, 1955, d. son of Leeming and Margaret Hull. Son: James Douglas, b. Wiarton, Sept. 03, 1982. 10 2. Constance Louise, b. March 5, 1958 X 3. Lynn Robert, b. Feb. 23, 1961. 10 4. Crystal May, b. August 7, 1963. 9 1. Mary, b. July 25, 1931 (Mrs. Bertrum Hagedorn), R.R. #3, Bright, Ont. 2 sons, 1 daughter: Carson, Donna, Kevin. 9 2. Donald C., b. April 17, 1934, m. Kitchener, to Shirley Elaine Klem. Live in Waterloo. 3 daughters: Wendy, Penny, Pammy (could this really be Tammy?). 9 3. Elaine, b. Dec. 3, 1935 (Mrs. Eric Lawrence), Aldergrove, B.C. 3 daughters, 1 son. 9 4. Audrey, b. Feb. 7, 1943 (Mrs. Dopglas Brighton), R.R. #1, Elmwood, Ont. 2 daughters, 1 son. 8 William Henry Rieck, b. Kitchener, July 31, 1907, d. Married twice: (a) Irene Henry, Aug. 30, 1930; (b) Toronto, Ont., Feb. 16, 1946, to Martha Adams, b. Auburn, Ont., April 16, 1916, daughter of Thomas Adams and Florence Beadle. Worked for Uniroyal Tire & Rubber. 9 1. Richard William Edward, b. July 05, 1931, m. Kitchener, July 25, 1953, to Madeline Riehl, b. Feb. 7, 1932, daughter of Arthur Riehl and Ida Randall; no children. 9 2. June Louise, b. July 25, 1934 (Mrs. Raymond Pauhl), Kitchener 2 sons, 1 daughter: David, John, Catherine. 9 3. Sheila Ann, b. Jan. 29, 1948 (Mrs. Robert Lewandowski), Windsor, Ont. Daughter: Sarah. 9 4. Sandra Louise, b. Nov. 29, 1950 (Mrs. Kenneth Lem), Scarborough, Ont. 1 son, 2 daughters: Adam, Julie, Emily. 9 5. Timothy William (Rev.) b. June 23, 1955, m. Steinbeck, Man., Dec. 28, 1975, to Barbara Berg, b. Lanigan, Sask., daughter of Harold and Edna Berg. Living temporarily in Denver, Col. 1982-83. 10 Joel Timothy, b. June 24, 1979. 10 Troy James, b. March 4, 1981. 8 Lorne John Rieck, b. Kitchener, May 15, 1914, d. m. Linwood, Ont., June 27, 1936, to Idella Louisa Newmaster, b. North Easthope, Ont., Jan. 29, 1910, daughter of Louis Newmaster and Olive Lanz. Worked at Huck Glove Co. Ltd.
9 1. Joan Olive, b. July 23, 1937, m. Kitchener, Oct. 16, 1965, to Douglas Peter Hube. Live Edmonton, Alberta. 2 daughters: Sharon Elizabeth and Susanne Louise.